What makes our work of Craniosacral Therapy so special and such an adventure is the fact that it is so in the "Now." It seems in the current "now," all of our daily lives are filled with the ill effects of chaos, cruelty, anger and violence in our troubled world. Patients challenge us to try to be present and hold space for those struggling with the physical and emotional effects of our lives. To be sure there is good, beauty, love and happiness in the world, but our patients teach us about the other side. Nobody comes to us complaining of feeling too happy, too content or well loved. Patients come before us and teach us about our collective understanding of troubles and sources of pain and suffering. We can kill our planet and end life as we know it within our lifetimes by not taking action to reverse climate change. We can see how precious and fundamentally important clean water is by the lessons playing out in Puerto Rico for the past many months. We see daily how painful and intolerable life is that so many young among us have turned to prescriptions and opiates to get numb and free of their painful lives. And we even are brought to question ourselves and our own understanding about truth and facts by the way leaders and corporations in our culture and other cultures of the world have distorted and misrepresented themselves, their motives and basic facts enough to cause all of us to question our values, elected officials and even our neighbors and family members. All these things we now know can make ourselves and others ill, full of worry, suffering and pain and turn us all, at some point, into patients. We all can and likely will be patients sometimes. Patients teach us we all need to get help and treatment and work on ourselves too. It is life. I have asked myself, "Don, can you always remain impartial, non-judgmental, ego-subordinated and unconditionally present?" No...I cannot. Sometimes I get wrapped up in the "Now" of life. Whether it be on the table or in my own daily life activities with business, family, friends, children, community, working on my little farm or watching the news from the couch. Patients teach us we are human, we are reactive, vulnerable and we have our own morals, values and triggers. Patients bring us a reality check that -- no matter what -- we need to try. Patients teach us to clear ourselves and work intentionally to stay present and not be triggered by an emotion or story that may come out on the table. Patients remind us we are human. When they have an emotional response that causes them to feel authentic emotion, we learn by holding them and experiencing their response what an authentic emotional response is and what a body reaction looks and feels like. Patients constantly teach us (with lots of practice) how to be neutral and hold space for emotions to express without being reactive or caught up in the charge of them. 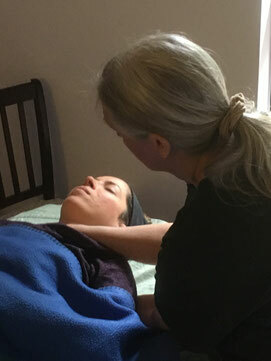 Being taught to be present for our patients we can learn to be present for ourselves and connect to our own healing potential. As we help our patients by extension, we can carry informed awareness to the rest of our lives and may see a way forward to help each of us and collectively the world. Our patients show us what is possible to heal with CST and well-intentioned touch. The Inner Wisdom of our patients is what teaches us. It teaches us that when the rhythm stops, what happens next is truth. I remember my teacher John Upledger saying many times, "I know what I know and can do what I do because I have been taught by my many patients who have been my teachers." We do best as therapists when we humbly connect, wait and watch what the body has to teach us. Our old refrains apply here. We blend and trust, let time be our ally and remain present and still enough for the healing solutions to come to the knowing of the patient. We learn this skill from our patients. Our patients, one and all, are our teachers. Thank you for reading. Comments welcome.